Apple's revised 13, 15 and 17 inch MacBook Pros deliver Intel's blazing fast new Sandy Bridge Core i5 and i7 CPUs, new AMD Radeon HD (formerly ATI) dedicated graphics performance on the high end and a new high speed Thunderbolt port, resulting in the fastest notebooks currently available while inheriting the long battery life, the strong, minimalist unibody construction, and the environmentally friendly design of previous year's models. 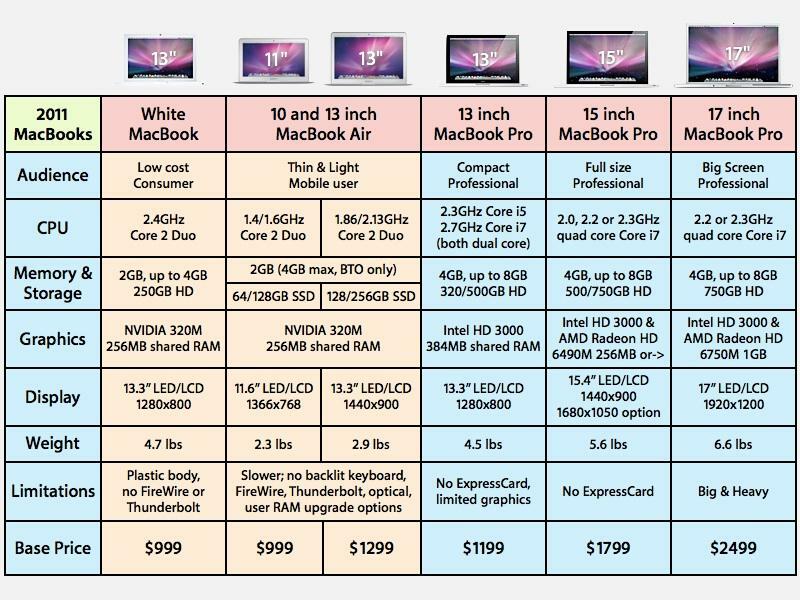 The MacBook Pros gain a stronger edge in both processing and graphics performance over the entry level white MacBook and compact MacBook Air, with the entire Pro lineup now supporting new Sandy Bridge versions of the Core i5 and i7 chips, leaving the older Core2 Duo reserved for the budget minded $999 MacBook and light, thin MacBook Airs. Additionally, while the MacBook and Air models continue to use the NVIDIA GeForce 320M as their graphics chip and system controller, the Pros have moved to a roughly comparable Intel HD Graphics 3000 graphics processor within the Intel platform system controller (which shares 384MB of SDRAM from system memory). The 15 and 17 inch models add a secondary AMD Radeon HD graphics chip that kicks in automatically when needed. 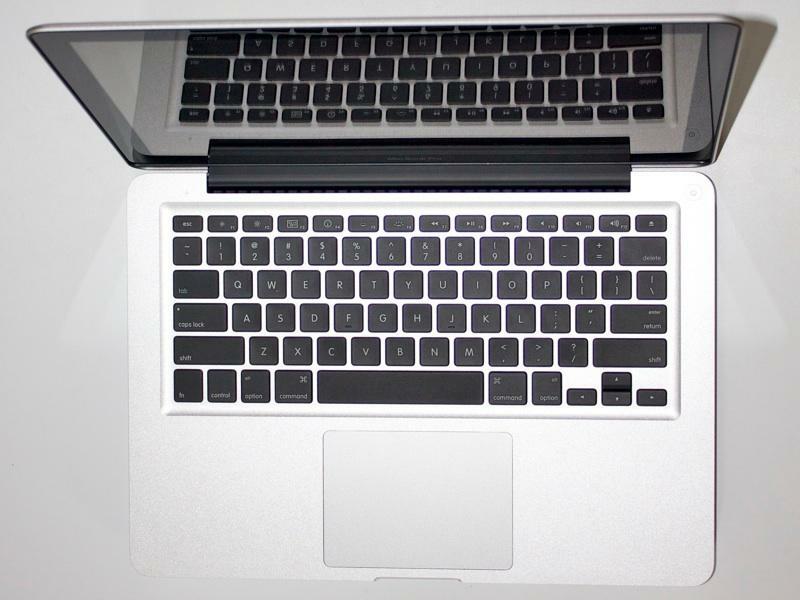 The 15 inch MacBook Pro supplies a base option of the AMD Radeon HD 6490M with 256MB GDDR5 RAM, or offers a higher end option of the AMD Radeon HD 6750M with 1GB GDDR5 RAM. That second option is the base standard for the 17 inch model. The new chips make this generation of MacBook Pros not just faster than Apple's previous notebooks, but also faster than Apple's current desktop iMacs, with scores that bump up towards the Mac Pro workstation and its multicore Xeon engine. PC reviewers have noted that Apple's notebook lineup is currently the fastest available from any vendor, thanks to the company's early adoption of Intel's latest generation of CPUs. Over the past few years, Apple began a migration away from Intel's own chipsets that support the CPU (and which have included Intel's rather anemic integrated graphics chips), building a strategy that paired Intel's Core2 Duo CPU with an NVIDIA chipset with far faster integrated graphics. However, Intel killed this plan by integrating functions once provided by the supporting chipset, including the memory controller and graphics, into the CPU package itself. The Intel Core i5 and i7, first introduced last year in the Arrandale platform, continue to integrate CPU cores with memory and graphics under the Sandy Bridge generation, and similarly require an Intel chipset for other I/O and related functions. 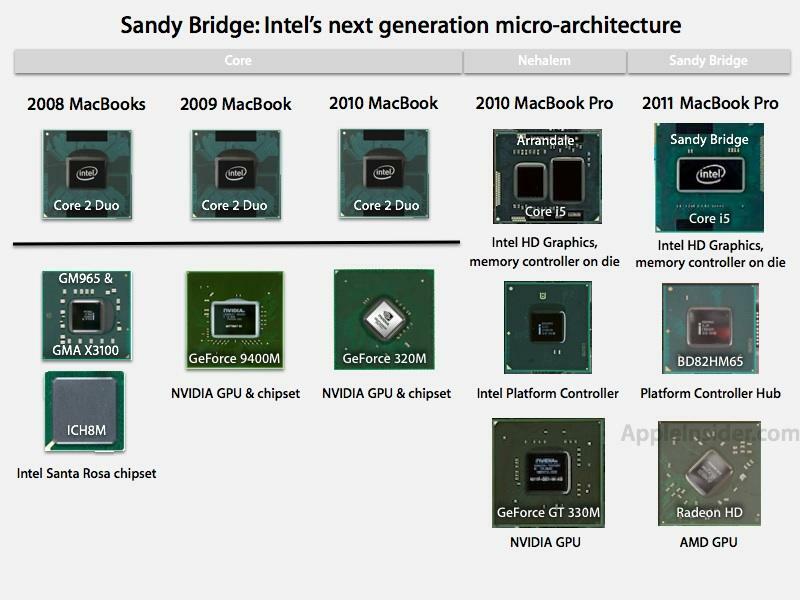 While the former 13 inch MacBook Pro skipped the Arrandale generation and continued to use the Core2 Duo/NVIDIA chipset combination, the new 2011 Pro models all take the same leap to Sandy Bridge. While Intel isn't as good at graphics as NVIDIA, Intel's SATA disk controller performance is significantly better than that of NVIDIA's; the new models also now support 6Gbps SATA 3.0 for the first time, so the fact that the new MacBook Pros use Intel's chipsets again means that disk performance is improved, particularly when using a Solid State Drive. Note that only the hard drive supports SATA 3; the optical drive is still connected to a 3GBps SATA 2.0 interface. Apple has hopped back and forth between NVIDIA and ATI for its dedicated graphics chips for many years now. After acquiring ATI, AMD has now changed its branding to AMD across the board, making this the first Mac to sport AMD-branded processors, albeit just for graphics and not CPUs in competition with Intel. The new MacBook Pros with dual graphics chips (apart from the 13 inch model that only has Intel graphics) continue to use automatic switching technology that enables them to coast along using the integrated Intel HD Graphics GPU, and then switch to using the dedicated new AMD Radeon HD whenever advanced graphics are needed. This is triggered whenever an external display is plugged in, and whenever software calls OpenGL, OpenCL, Quartz Composer, Core Animation or Core Graphics functions. On page 2 of 3: FaceTime HD, Thunderbolt, Graphics & Batteries, and Unique features among the three MacBook Pro model sizes.